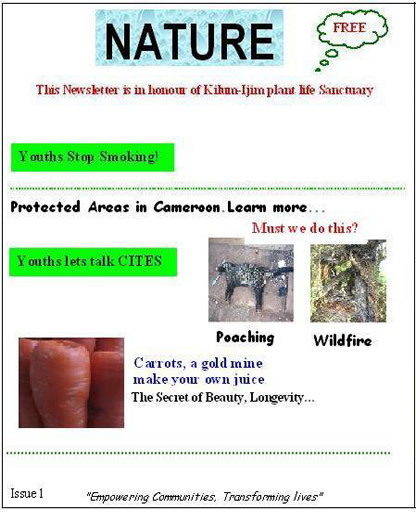 The above magazine is full of interesting issues on conservation efforts in different parts of Cameroon. 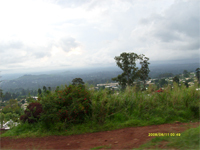 It is principally in honour of the Kilum-Ijim life sanctuary in the North West Region of Cameroon. Buying a copy of this magazine goes a long way to strengthen the joint effort towards the conservation of nature, sensitization of youths and community empowerment towards sustainable development. The methodology of the study consisted of consulting secondary sources, direct field observations, diachronic analysis with the aid of aerial photographs and satellite images using GIS software, administration of questionnaires and group discussions. Some first results obtained in this research were carried out with the objective of evaluating the rate at which wetlands are being degraded in the area, as well as identifying factors which account for this degradation. In this section of the research, based on the indicators of lost surfaces (change to dry land area) and transformed surfaces (to other uses like infrastructure and farmlands), it was found out that the wetlands of this region were degrading at a fast rate of about 1.17%; with possibilities of complete depletion by 2049. In the same vein the fauna and flora biodiversity has been highly degraded. Before the 1970s, this region contained a dense swamp forest, composed of very huge animals like elephants, hippopotamus etc. Today most of these species have been extinct from the region. Equally an increase in farming activities have led to erosion of lose soil particles which render most water courses highly turbid during periods of intense rainfall. Factors accounting for these changes were mainly seen to be anthropogenic in nature and linked to population increase. Extensive rice cultivation, food crop cultivation, transhumance, bush fires and the extensive use of chemical fertilizers were identified as some of the main factors contributing to wetland degradation. These factors continue to exacerbate as the population of this subdivision keeps increasing in tandem with agricultural needs. Key words: Wetland, degradation, impacts, biodiversity, diachronic analysis. The Ndop floodplain is estimated to have an area of 4000km2 and directly sustains a population of 200,000 inhabitants of whom 70% are involved in activities like agriculture, fishing, grazing, hunting and gathering. In 1970, a large agro industrial scheme called the Upper Nun Valley Development Authority (U.N.V.D.A) was created in this region. 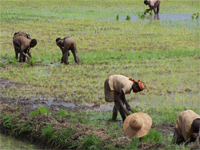 Their main objective was to promote large scale rice cultivation as a means of promoting rural development, alleviating food crises and boosting the economy of this plain. During the early days of its creation, this scheme embarked on large scale clear-cutting and transformation of wetlands to cultivable fields. This entailed heavy destruction on the natural environment since swamp forests, date palms and raffia palms were all cleared away. Rice fields were developed, covering over 1,531.12 hectares. There was a total change of activity in this region from hunting, fishing and subsistence agriculture to rice cultivation. Over 6000 local residents got directly recruited by this company. Initially, the company registered success but recently due to a heavy importation of rice from other countries, this region was not able to keep pace with the competition. This led to a fall of the U.N.V.D.A, leaving most farmers stranded. After research in this region, it was discovered that before the implantation of this agro industrial scheme, this region had a rich biodiversity of large mammals, reptiles and fish. The flora biodiversity was equally rich and luxuriant. More than 80% of the population were thus hunters and gatherers. But from the 1980s, much of these were extinct due to habitat destruction. This led to a conversion of over 70% of the locals to rice farmers. Over 90% of the population confirm initial satisfaction from the activities of the U.N.V.D.A but today, the fall of the company greatly accounts for the high level of unemployment and rural exodus in the region. The landscape has been highly degraded and many people can no longer return to their initial activities. This clearly validates the hypotheses that the U.N.V.D.A did more harm than good in this region. There is therefore a need for sustainable exploitation practices within this plain. Key words: Ndop flood plain, UNVDA, biodiversity, sustainable exploitation, extinct. 3. Reseach theme: THE DEGRADATION OF RAFFIA PALMS AND IT’S SOCIO-ECONOMIC AND ECOLOGICAL CONSEQUENCES: THE CASE STUDY OF BAMUNKA, NDOP, NORTH WEST PROVINCE CAMEROON.